Researchers at Children’s Hospital Los Angeles (CHLA) have made an important step toward finding a target in the fight against drug-resistant neuroblastoma (NBL), the most common solid malignancy found outside of the skull in children. Led by Muller Fabbri, M.D., Ph.D., of the Children’s Center for Cancer and Blood Diseases and The Saban Research Institute of CHLA and published online in the Journal of the National Cancer Institute on May 13, 2015, the study looked at how exosomic miRNAs released within the tumor environment affect resistance to chemotherapy. The article is titled” Exosome-Mediated Transfer of microRNAs Within the Tumor Microenvironment and Neuroblastoma Resistance to Chemotherapy.” Exosomes are vesicles or “envelopes” that are secreted by cells and that can deliver their cargo to other cells. This cargo can include microRNA (miRNA) – small molecules that are not translated into working proteins, but may regulate basic cellular processes. For example, miRNAs are important for regulating protein production by repressing or turning off genes. “The main reason for the recurrence of neuroblastoma – and essentially all types of cancer – is a growing resistance to treatments such as chemotherapy” said Dr. Fabbri, who is also with the Norris Cancer Center at Keck School of Medicine of the University of Southern California. “The goal of this study was to assess whether, and to what extent, exosomic miRNAs are involved in the development of drug resistance through the tumor microenvironment.” Within the tumor microenvironment, where cancers grow and acquire the ability to metastasize and develop resistance to treatment, there is a lot of cross-talk. Exosomes are involved in this inter-cellular communication by shuttling messages between NBL cells and monocytes, neighboring white blood cells that are part of the body’s innate immune system. Tumor-associated macrophages (TAMs) are also found in close proximity to the tumor and are derived from circulating monocytes. TAMs function in both pro-tumor and anti-tumor ways depending on the type of cancer. In NBL, TAMs represent a negative prognostic factor and the CHLA scientists hypothesized that TAMs somehow affected resistance to chemotherapy through the exchange of exosomic miRNAs. The scientists found that specific miRNAs were exchanged (via exosome “envelopes”) between the tumor and TAMs and discovered the process by which cancer cells release these envelopes and TAMs receive them. As a result of the exchange a specific microRNA called miR155 which is seen at high levels in tumors is up regulated. Yet when the researchers looked for expression of miR155 in cancer cell lines it was surprisingly low. It turns out this is because miR155 doesn’t derive from the cancer cell line but from the tumor microenvironment and is secreted by the exosome back to the cancer cell where it silences an important gene – TERF1. TERF1 is present at telomeres (essential parts of human cells that help determine how cells age) throughout the cell cycle and functions as an inhibitor of telomerase – an enzyme found in tumors. The telomeres of normal cells act as an “internal clock” that measures when cells become old and should die; in cancer cells high telomerase activity continuously resets this clock. “So the cancer cells continue to live even when they are supposed to die,” Dr. Fabbri explains, adding that high telomerase activity is a hallmark of cancer and TERF1 protein levels are low in cancer cells that are resistant to chemotherapy. When miR155 is delivered via the exosomes, it suppresses TERF1 leading to increased telomerase activity and increased resistance to chemotherapy. The researchers concluded that if the cross talk can be blocked – in essence stopping the “mail delivery” of exosomes to cancer cells – the cancer cells would start dying again in the presence of chemotherapy. 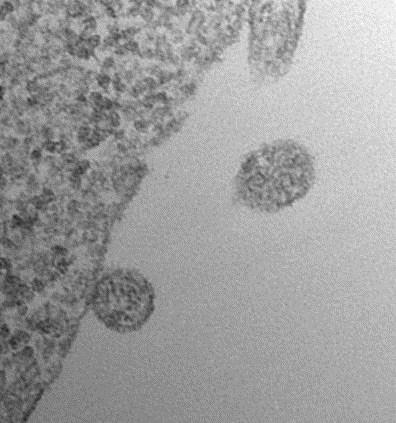 They tested their hypothesis in vitro and in vivo using artificial exosomes containing miR155 and blocking them with a molecule (GW4869) known to silence production of exosomes. They observed what they suspected would happen – more cancer cells died with chemotherapy treatment when the exosome delivery system was blocked. Moreover, they did not observe toxicity in animal models as a result of this process. The next step is to find out how to block only those exosomes carrying the cargo that silences TERF1 and not those that are “good” messengers – because exchange of messages through exosomes also occurs among normal cells. “By discovering this complicated molecular mechanism behind how the presence of TAMs works to worsen the prognosis of a patient with neuroblastoma we now know what to target,” said Dr. Fabbri. Additional contributors to the study include Kishore B. Challagundla, Petra M. Wise, Paolo Neviani, Haritha Chava, and Mariam Murtadha, CHLA and Norris Comprehensive Cancer Center Keck School of Medicine University of Southern California (USC); Tong Xu and Amir Goldkorn, Norris Comprehensive Cancer Center USC; Rebekah Kennedy, Michael Hadjidaniel, Ambrose Jong Hiroyuki, Shimada Shahab Asgharzadeh, and Robert Seeger, CHLA; Cristina Ivan Xinna Zhang and George A. Calin, University of Texas MD Anderson Cancer Center; and Ivan Vannini, Francesca Fanini, and Dino Amadori, Istituto Scientifico Romagnolo per lo Studio e la Cura dei Tumori Italy. Children's Hospital Los Angeles (CHLA) has been named the best children’s hospital on the West Coast and among the top five in the nation for clinical excellence with its selection to the prestigious U.S. News & World Report Honor Roll. CHLA is home to The Saban Research Institute, one of the largest and most productive pediatric research facilities in the United States. CHLA is also one of America's premier teaching hospitals through its affiliation since 1932 with the Keck School of Medicine of the University of Southern California.